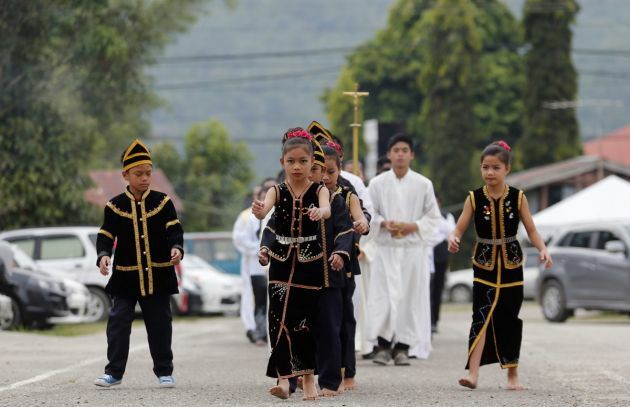 (Photo: REUTERS / Bazuki Muhammad)Sabah Christians walk during a procession ahead of Sunday Mass to celebrate Malaysia Day in Tambunan September 16, 2012. With a general election due within seven months, the 13-party ruling Barisan Nasional coalition is banking on Sabah and neighbouring Sarawak state on Borneo island to prolong its 55-year grip on power. The National Evangelical Christian Fellowship held prayer meetings across the country for Malaysia Day on September 16 - a holiday marking Sabah and Sarawak's entry into Malaysia 49 years ago. The Borneo states agreed to join Malaysia on condition that religious freedom as well as the protection of native lands and cultures were guaranteed. Police officers in Malaysia's Serdang area have been accused of trying to stop a church service during the week after receiving complaints about the disturbance it created. A lawmaker has denounced the police action saying the local council should have acted on the complaint as it was the appropriate authority to deal with the issue. Two officers arrived at Serdang's Bethany Church and asked Pastor Nelson Sembiling to halt his Sunday church service, saying people nearby complained, said Member of Parliament Ong Kian Ming. Ong said the pastor managed to send the officers away after he convinced them to speak to a top official of the National Evangelical Christian Federation (NECF), the Malaysia Insider reported. "What the two policemen did at Bethany Church is an infringement of the constitutional right of freedom of religion of the members of the church and Pastor Nelson," the lawmaker said in a statement on December 3. "Short of someone committing a crime or there being a life threatening emergency, the police have no right to disrupt the services of any religious organization," noted Ong. A high-ranking Kajang police insisted that his officers were merely validating the complaint they received earlier, which said that there was a lot noise from the church during its service. "Policemen went to check. No church service was stopped," Kajang police chief Assistant Commissioner Ab Rashid Ab Wahab said. "Police were just there to check what it was all about and after being informed that a church service was being conducted, the officers left." The complainants pointed out that the service was held in a shop, which was illegal, the official added. While acknowledging that the service in the shop could be construed as illegal, Ong countered that police still did not have jurisdiction over the matter. He asked Rashid to conduct an investigation into the incident, and have his officers apologize to the pastor and the church. Ong said he intended to meet with the police official to discuss the matter and secure a guarantee that similar incidents would not happen again.